Christmas show,” Louise Beard, one of the producers, said. “It is a show about families and the struggle to get through life. A lively musical score and tap numbers have been added to the basic storyline of A Christmas Story. “The tap dancing evolved because we found a child, Luke Spring, who was a tap wonder,” Beard said. “The opening of the second act was re-staged to showcase him. He will be in the ensemble cast again this year,” she added. “The kids in the Broadway production were totally amazing—professional, polite, talented and adorable.” Beard said. Long sessions of auditions were held in New York City with most of the casting accomplished during the Spring and Summer of 2012. Rehearsals began that Fall. Other than the addition of music and dancing, Beard said they tried to keep all of the popular, humorous scenes found in the film that people love. Playgoers will be entertained with numbers centered around the Red Ryder BB Gun, the Major Award Leg Lamp, Ralphie’s mouth being washed out with soap, Chinese Food on Christmas after the Bumpus hounds devour the turkey, and more. 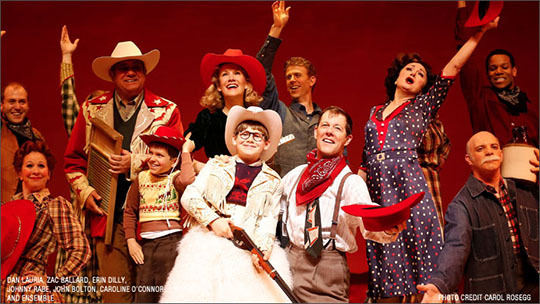 A Christmas Story, The Musical is on tour this holiday season, opening in Hartford, CT on November 12, then traveling to Boston, and New York. Returning cast members are: Dan Lauria (Jean Shepherd); John Bolton (The Old Man); and Erin Dilly (Mother). Jake Lucas is the new Ralphie.The original Broadway director, John Rando, and choreographer, Warren Carlyle, are part of the creative team. Peter Billingsley, who was the original “Ralphie” in the movie, is now one of the producers of A Christmas Story, The Musical. As an above the title producer, Beard was responsible for raising a set amount of money for the production. “I also was involved in some of the marketing meetings and rehearsals,” she said. Beard is working on several projects for the future and hopes to be able to announce them soon. 2009: Opened in Kansas City. Played in Seattle, for two months at the Fifth Avenue Theatre. 2011: On Tour in Raleigh, Hershey, Tampa, Detroit and Chicago. 2012: Opened on Broadway in November and December at the Lunt Fontanne Theatre. of a Musical which was written by Joseph Robinette. The Theater at Madison Square Garden, Dec. 11-29.
at the major numbers performed in the musical. Before becoming a producer of plays, Louise, owned Time Step Studio in Birmingham, AL where she taught adult tap dancing for 29 years. Each year, she choreographed, directed and produced elaborate tap shows. I was one of her students who benefited from her love of dance and dedication to her art. She was so committed to her students that, when she retired in 2008, she arranged with Alabama Ballet to take over her classes. She is such an inspiration to me and an example that re-invention is possible at any stage of life. 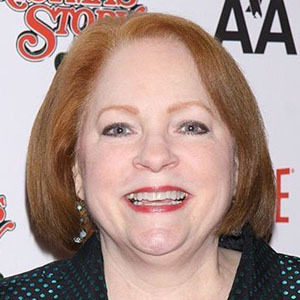 After only four years in her new career, she became an extremely successful producer of A Christmas Story, The Musical which was nominated for the Best New Musical Tony Award this year. Totally inspiring! With the Christmas season around the corner, it’s almost time to revisit my favorite holiday movies. One of the films that has become a tradition with me is A Christmas Story. It’s a hilariously funny story about a young boy named Ralphie who is on a quest to receive a Red Ryder BB gun for Christmas. It reminds me of my brother who ran a similar campaign during the early 1960s, a good 20 years before the movie was made. Like Ralphie’s mom who said, “You’ll shoot your eyes out”, our mother reasoned that my brother could not have a BB gun because he might accidentally shoot himself or someone else. Since my brother always liked to practice his wresting holds on me, I was not enthusiastic about his acquisition of a BB gun, either. Unlike the film, and fortunately for me, my parents held firm. The family comedy film, A Christmas Story, is celebrating its 30-year anniversary this holiday season. Warner Brothers plans to release an anniversary edition this November in Blu-ray, NTSC, Widescreen format. Starring Melinda Dillon (Mother), Darren McGavin (The Old Man) and Peter Billingsley (Ralphie), the MGM movie was directed by Bob Clark. The script was written by Bob Clark, Jean Shepherd and Leigh Brown. It was based on the writings of Shepherd, author of In God We Trust, All Others Pay Cash. Original music for the film's score was by Carl Zittrer and Paul Zaza. Popular Christmas songs and classical music were also part of the score. The 1983 film was very low-budget and did not do well at the box office. Turner Entertainment Co. acquired the rights to the film when Ted Turner purchased MGM's pre-1986 library. Once WTBS started showing the movie every Christmas Eve and Christmas Day, it became a seasonal favorite and eventually a cult classic. Later, Time Warner purchased Turner Entertainment, and currently owns the film. The popularity of the movie led to the creation of a Broadway musical of the same name. Historically, it’s not unusual for a hit play to be turned into a film. Even in the silent film days, plays provided the content for many movies. Today, the reverse is often true with some films being successfully re-worked for stage production. 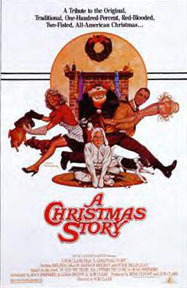 A Christmas Story, The Musical is a recent example of a successful screen-to-stage adaptation of a popular, classic film. Be sure and read the accompanying interview article with Louise Beard, one of the producers of the musical and a Birmingham, AL native. She gives much information about the making of the musical and insights into why A Christmas Story (both the movie and the musical) is such phenomenal entertainment. The 1983 film was so low-budget that when it was first released, Louise Beard remembers seeing a microphone that was unintentionally left hanging during a whole scene of the movie. “I’m sure this was because there was no money left over to correct the film at that time.” A quick check with IMDb verifies that,”When the kids run to their seats in the classroom after putting the plastic teeth in their mouths, a shadow of a boom mic is visible on the wall as the camera pans right to left.” The internet movie database lists more than 90 instances of “goofs” in A Christmas Story with most of them being continuity issues or items/props from a time period different than the time period of the movie (1940). Even the Red Ryder BB gun box used in the movie was from the wrong year. It just goes to show that an imperfect movie can be perfectly entertaining and best viewed without a microscope. It doesn't hurt to have great actors, either. Darren McGavin will always be remembered for the comic antics of the grumpy father. And Peter Billingsley's portrayal of Ralphie and his humorous quest for a BB gun will entertain many generations to come. Bob Clark (1939-2007), the director of the movie version, was born in New Orleans, but grew up in Birmingham, AL. Surprisingly, his career started with films in the horror genré. For 10 years prior to the making of A Christmas Story, he worked in Canada and was responsible for some of the most successful films in Canadian history.